When the weather get’s chilly, all it takes is a mug of chocolatey cocoa goodness for us to get warm. Add a touch of peppermint and ‘monster mallows’ to the mix and we’re in heaven. Since most of our friends & family feel the same, we decided to come up with a super easy kit to give on the go with ease. The best part is it’s cute, cheap and 100% delicious! 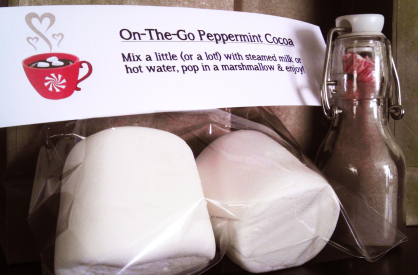 Regardless of your gift giving packaging, you’ll need a box of prepackaged Cocoa Mix, a bag of HUGE marshmallows (or as we like to call them ‘Monster Mallows’) , mini peppermint pillows, a funnel and a small bowl or tupperware container. You can package your kit anyway you wish but we used some adorable mini glass bottles and resealable bags left over from an event we had last year. You can use mini-mason jars if you cant find the mini glass bottles but sealable snack size sandwich bags always work beautifully for the monster mallows & cocoa powder alike. We used the resealable bags we had to place 2 monster mallows inside each. Since the bottles we had to fill were ‘narrow necked’, we used the funnel to place the cocoa inside and did the filling over an open tupperware container to catch anything that might have spilled. About 2 packets were used to fill each bottle and thanks to a little ingenuity, a little room was made at the top for the mini peppermint pillows. Like any other powder, the more compact you make it, the more you can fit inside. We sealed the bottle and gave it a soft slam on the table in between packets to condense the powder and fit as much of that chocolatey goodness as we could inside. This method left a perfect space for the mini peppermint pillows to rest sweetly at the top while still allowing enough room to seal the bottle. VOILA! Our sweet little peppermint cocoa kits were finished and ready to be packaged for giving! Since we wanted to ship these as well as give them in person, we decided to be uber frugal and continue to use items we already had in our home. For the shipped versions, we used some of our empty mini boxes (courtesy of our swoontastic birchbox subscription) to hold the kits wrapped in left over tinsel from old XMAS Decor. For the face-to-face versions, we popped them into festive bags and finished with tinsel – even adding a personalized mug for those who’d just moved into a new home or deserved a little something extra this year. TAADAAAA!!! What started out as a simple project for a secret santa gift ended up as one of the most well-received hostess gifts we’ve ever had the pleasure of giving and all made with 100% love!